Named a Gartner “Cool Vendor” in Unified Communications and Collaboration Technologies, global software and services company UIB solves the problem of how to talk to cloud-connected software, services, chatbots, and devices. 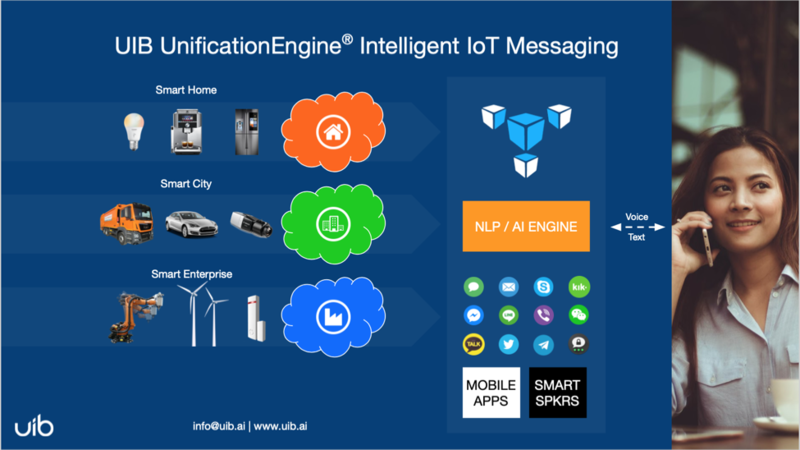 UIB provides its customers, partners, and developers with omnichannel messaging solutions using its patented UnificationEngine®, Unified AI®, and SmartContact® technologies. Adding our UnificationEngine-powered SmartContact to your smartphone’s address book, allows you to talk to any connected “thing” or service on over 20 of the world’s most popular communications platforms, including email, SMS, smart speakers, social media messaging and chat apps (including Facebook Messenger, WeChat, and many more). Our technologies help smart home and connected appliance manufacturers, real estate and PropTech companies, hospitality companies, telecommunications providers, museums, airlines, enterprise software companies, government authorities, and others to increase their revenues, decrease their costs, and delight their users. With a SmartContact in your smartphone’s address book, you can talk via natural language voice and instant messaging to any device on any channel in any language with or without the device’s native mobile app or a virtual assistant. Learn more about UIB now at www.uib.ai, try out UIB’s UnificationEngine for yourself at demo.unifiedbox.com, and download UIB’s newest white paper at www.uib.ai/whitepapers. 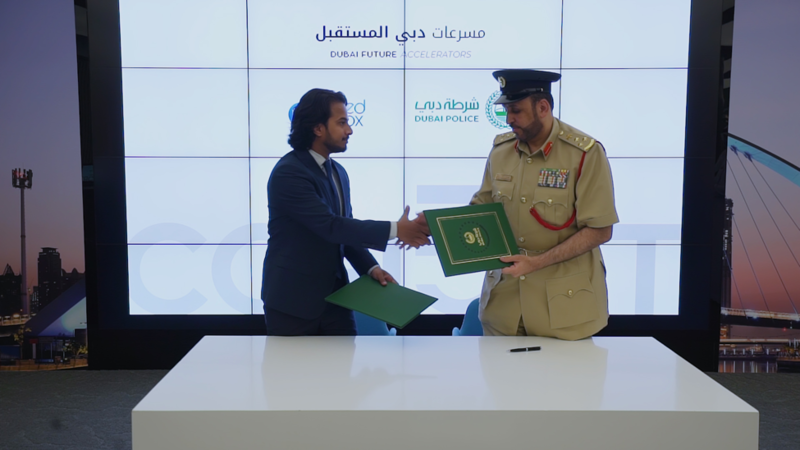 Photo: UIB Sales Director Mr. Gulraiz Khalid Khan (left) and Dubai Police Brigadier Dr. Abdulla Bin Sultan (right) shake hands after signing the agreement at Dubai Future Accelerators headquarters in Dubai, UAE. 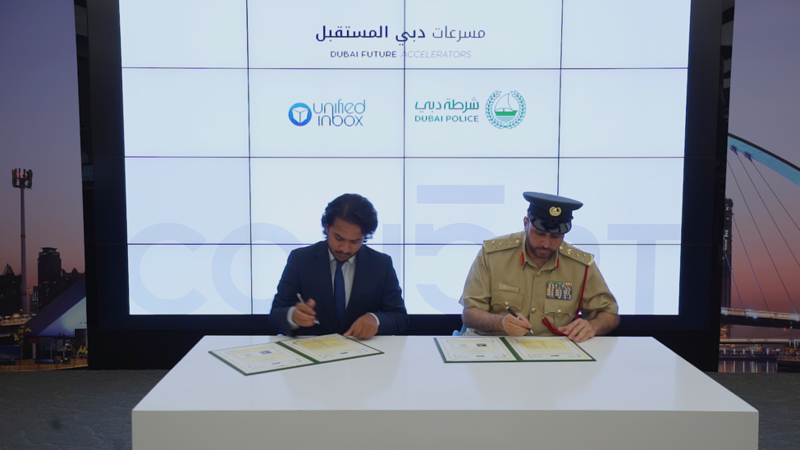 Photo: UIB Sales Director Mr. Gulraiz Khalid Khan (left) and Dubai Police Brigadier Dr. Abdulla Bin Sultan (right) sign the agreement at Dubai Future Accelerators headquarters in Dubai, UAE.